Today I would like to present my guitar wiring project based on an active buffer. The wiring is connecting together: a common, passive tone control, and an active buffer with a volume potentiometer. The target is to get an quite clean signal transport (more transparent tone), a clean working volume potentiometer (no treble losses), and a passive tone control – so there will always be the way to get some warmer tone, typical for passive guitar wirings. The project can be done basically in every kind of an electric guitar. No matter what kind of pickups and wood it got. The buffer construction can be based on > this project <. You can also use some other guitar buffer. 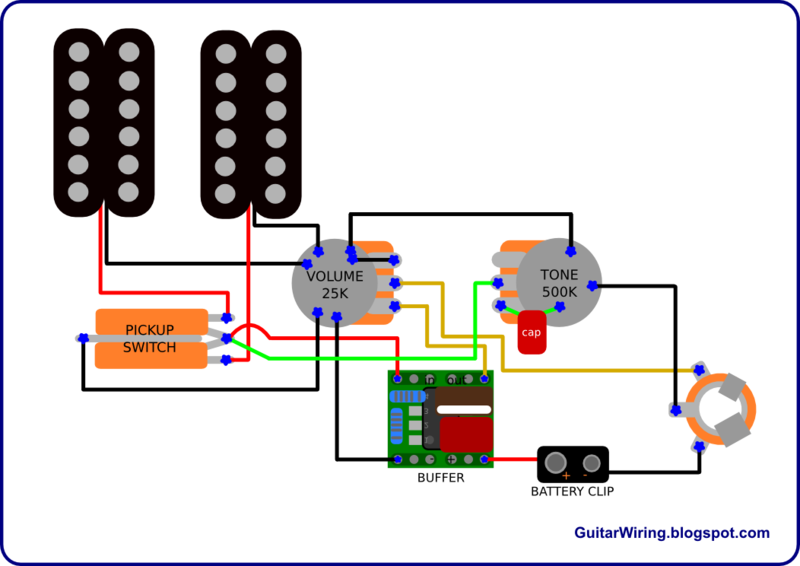 The diagram shows the example with humbuckers and a toggle pickup switch, but the wiring can work also with different pickups and switches. You need to remember, that the green wire should be always connected to the output lug of the pickup switch. I didn't put the tone capacitor value, because it depends on pickup types. >This article< can be helpful in choosing the right one. You can also use some common value, like 0,022uF. The green wire is the part of the tone control circuit. It's connecting the tone control to the main signal line (hot). It's connected to the pickup switch output lug - before the place where the signal meets the buffer. It's the passive part of the wiring, and it works similar to common, passive guitar tone control circuits, based on a capacitor and a potentiometer. The main signal line – red wires (yellow after the buffer) – is going to the buffer, before it will meet the volume pot. The buffer has got low output impedance, so vol. ctrl. will not affect the tone like in a passive wiring (treble bleed). Your guitar tone will be more open, natural and brighter. If it will be too bright, you can use a 250K tone pot, instead of the 500K. Remember that you have also the passive tone control to regulate this things. The powering system is quite common. Similar to EMG's active circuits. The buffer and a battery will be connected together when a jack plug will be in the socket. It needs a stereo jack socket. I recommend to use 9V battery. This gitar wiring project is something what connecting together: warmth of passive, potentiometer based tone control, and clean character of the active buffer with the volume pot. It can be very useful for those of you, who are looking for more natural, transparent tone with less treble losses, and who like to use common tone pots.